Growing up in the north east, York was probably my most-visited place on school trips and family days out. As such, there probably isn’t a museum in York that I haven’t visited. As a child, I loved the Jorvik with all of its sights and smells, but also the Castle Museum, mostly for all the old toys amassed there. The Railway Museum is fantastic whatever your age: it’s impossible not to climb aboard a gigantic train and pretend to pull the whistle! And I have been to York Minster a million times, though never in recent years because, I was outraged to find, it now costs about £8 to enter. At the risk of showing my age: it wasn’t like that in my day! 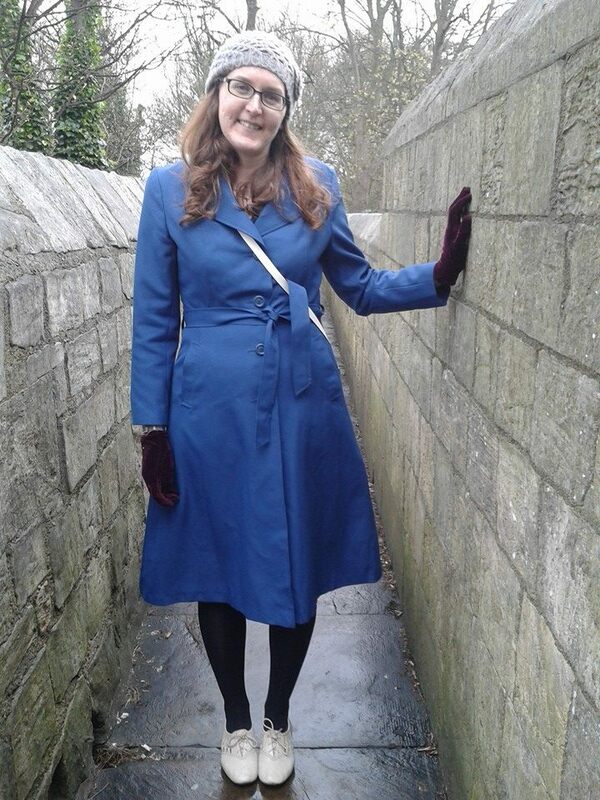 Far better, and cheaper, is a walk along the historic walls. If you’re anything like us, you can hum the Game of Thrones theme as you march along and look out for wildlings. It’s a great way to see a bit of the city and to understand how ancient it is. And where to eat? As a vegetarian, I joined most visitors to York in the queue for Betty’s Tearoom. But now I avoid waiting in the rain and breeze straight into Goji, a lovely little vegetarian restaurant. I’ve written about it before because I love it so. The menu had a good balance of vegan and vegetarian dishes, but the daily specials are usually the highlights. When I was there last December the specials board had a decidedly festive twist, and I couldn’t resist the nut loaf burger. Yes, a slice of cashew nut loaf with cranberry sauce in a bread bun. Of course, it was delicious. The roasties were a nice change from burger and chips, but the salad was a little out of place. Still, how exciting, to have a festive burger! Goji is a tremendous place to go for cake. The window display no doubt lures hundreds of people in (likewise the deli counter, it would be a great place to pick up a picnic in summer months), and the majority of the cakes are vegan. I’ve never disliked a cake from them. 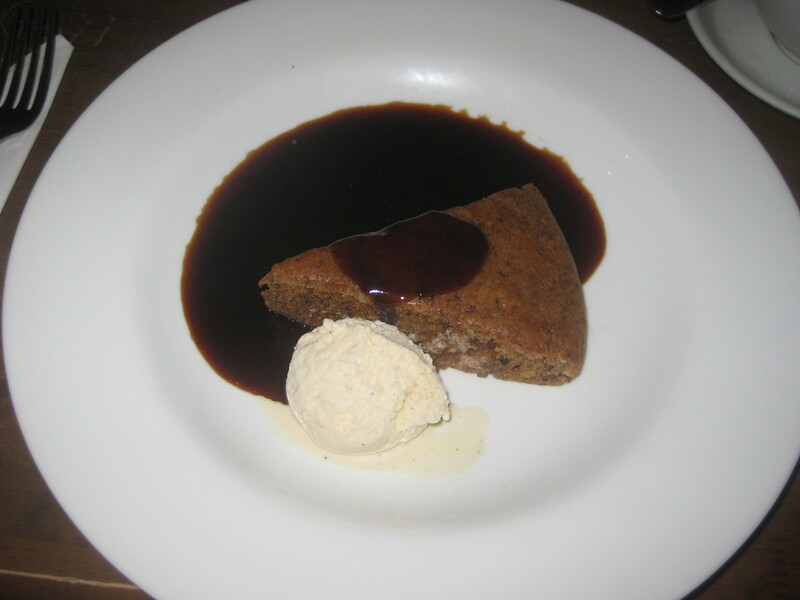 This time, though, I went for the sticky toffee pudding from the menu. The sponge wasn’t actually sticky, but it had all the flavours and the sauce was perfect. There’s nothing quite like ice cream melting into a warm sauce! York is one of my all-time favourite places, and any visitor to the UK simply has to go there. The city has so much charm – and so many vegan cakes in Goji! 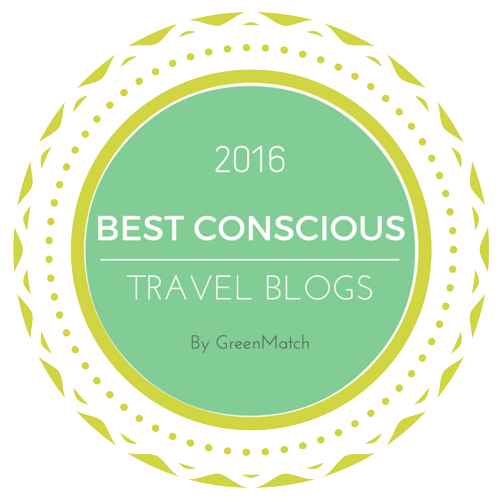 This entry was posted in Travel, Vegan Mofo and tagged Goji York, vegan mofo, vegan travel, vegan York, vgnmf16. Bookmark the permalink. I had York on my itinerary for my first visit to the UK 20 years ago and loved it – the shambles are so quaint. I am not sure where I ate but I almost cried at the sound of the nut roast burger for wanting to visit a cafe that serves such goodness (I am a nut roast enthusiast and did not encounter much nut roast on my last visit to the UK this year). Maybe it is rare to see them on menus now – the nut roast has a bit of a bad reputation as a very dry and boring meat-free option from the 90s, so maybe most chefs want to show that they’re more creative. This was definitely a good one though! 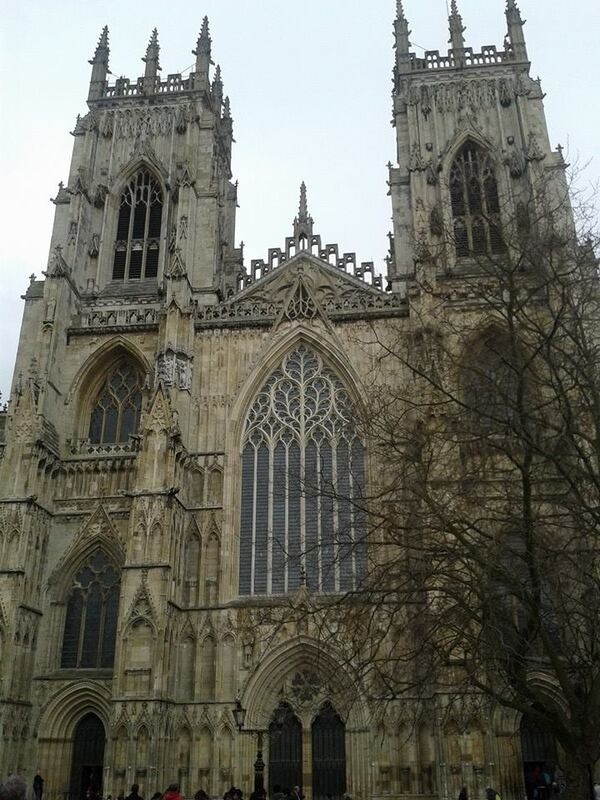 We went to York not so long ago and did pretty much the same as you – refused to pay to go into the Minster, walked around the walls, and went to Goji! I had a hot dog that was served in a whole baguette it was that big (it was really good) and we got cake to take home with us, which turned into more cake-mush by the time we got home but was also really good! It’s somewhere I really want to go again because the food was that nice. There’s a catering company here in the East Midlands that comes to vegan fairs etc that does nut roast burgers topped with onions and applesauce, at first I thought who would go to a vegan fair and get nut roast? But actually it’s really, really good. And nut roast in cobs is the best thing about having Christmas leftovers. Clearly this is the thrify vegan’s approach to York! Have you been to El Piano before? A lot of people rave about it, but I just don’t think it’s as good as Goji. 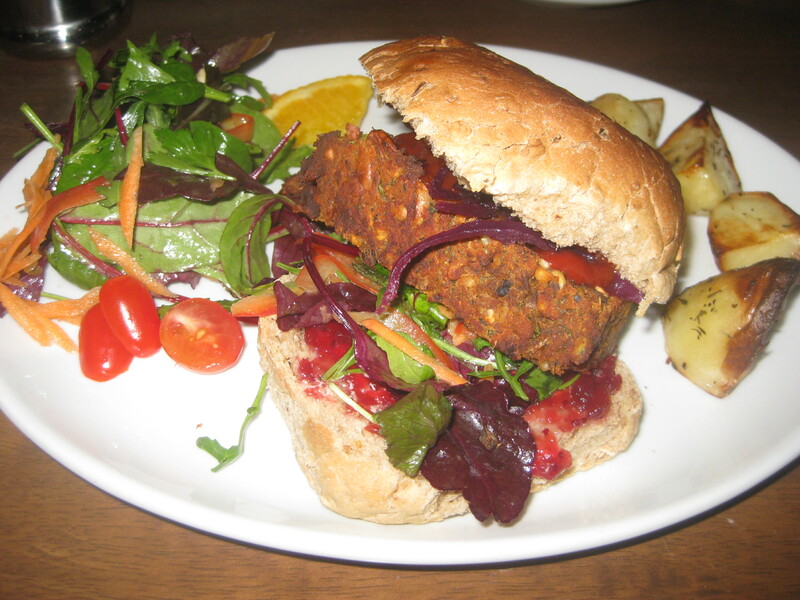 I’d never thought of a nut roast sandwich or burger before, but it’s definitely a good idea! I have York on my list of places to visit in the UK now that Brighton has been ticked off. I’ve heard of El Piano, but not always good so Goji, would def. be the place to eat. Enjoy Game of Thrones! And I would definitely recommend Goji over El Piano, if only for the cakes! York is one of the places we definitely want to visit one day! Good choice! It’s a small place, but really beautiful and with some solid vegan options. I haven’t been to York since I was tiny (and probably the minster didn’t cost £8!) but we keep talking about making a trip some day soon. I know now where I’m going for cake!